TAIPEI (TAIWAN)- Shark fins are not only popular in Hong Kong. A survey by WildAid shows that almost half of all Thai have eaten shark fin and plan to consume it again in the future. Also Taiwan is a big consumer of shark fins, importing about 500 tons of shark fins in 2017. WildAid has started campaigning Asia to raise awareness about the high shark fin consumption. Model Hannah Quinlivan, who serves as the global charity ambassador for WildAid this year, advocated for the “protect the ocean and say no to shark fin soup” campaign in a press conference in Taipei on February 3, urging the public to stop using shark fins for any diet in order to stop shark-finning and shark fin trading. According to Food Intelligence Centre Thailand, between 2012 and 2016 alone, Thailand has exported over 22,467 tonnes of shark fin and processed shark fin products and imported over 451.57 tonnes. Taiwan not only catches sharks for their fins but also imports them from around the world for consumption, adding that Taiwan imported about 500 tons of shark fins in 2017. Model Hannah Quinlivan, who serves as the global charity ambassador for WildAid this year, advocated for the “protect the ocean and say no to shark fin soup” campaign in a press conference in Taipei on February 3. Photo: WildAid. WildAid started the campaign last year in Thailand, where they did the survey togetehr with Rapid Asia. A large proportion of people remain unaware about the magnitude and cruelty of the shark fin trade, suggesting a concerning potential for increased demand for fins in Thailand, according to the report Shark Fin Demand in Thailand. 57% of urban Thais have ever consumed shark fin and 29% have eaten it within the previous 12 months. Alarmingly, 61% said they will consume shark fin in the future, citing curiosity and having heard from others that it tastes good, although shark fin itself has no flavor (flavor comes mostly from the broth that it is cooked in and added ingredients). Shark fins are mostly consumed at weddings (72%), family meals at restaurants (61%) and business meetings (47%). Preliminary market research by WildAid recorded at least 100 restaurants serving shark fin in Bangkok. Part of the campaign in Taiwan is from a health point of view. Large quantities of mercury, lead and other heavy metals have been found in shark fins. In the US the government issued a public warning for pregnant women and children to not consume shark fins for health reasons. And in neighbouring Hong Kong, heavy metals exceeding legal limits have been found in shark fins and lips during inspections of fish sold by fishmongers. From a food safety point of view, it is to be hoped that the Taiwanese government will attach much importance to this issue. All the more reason not to eat shark fins. 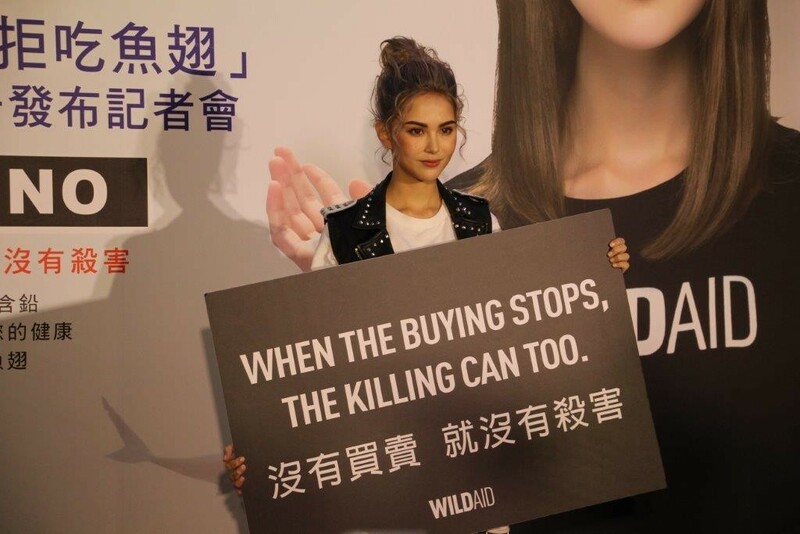 And if the buying stops, the killing can too, as said Hannah Quinlivan at the press conference.